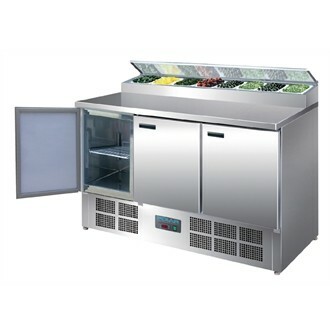 High capacity 3 door pizza/salad prep counter from Polar, with a refrigerated gastronorm countertop area taking 8 x 1/4 gastronorm pans upto 200mm deep. Features include user-friendly controls, digital display and automatic defrost. Has a maximum ambient temperature of 32 degrees and comes supplied with 3 adjustable shelves/3 floor protectors. Gastronorm pans sold separately. Power Type 220-240V, 1.6A single phase.